Sizing: this top is not comfy for me at shoulders/arms. its a little tight. T.T and i think i look very bulky in it. T.T why me so big size. but, its very cheap though! thats the only comforting pt. Design: probably because i treat this as a t-shirt instead of a usual blouse, i am ok with it not having inner lining. it really does look like a t shirt. HAHAHA. i am having double standards. 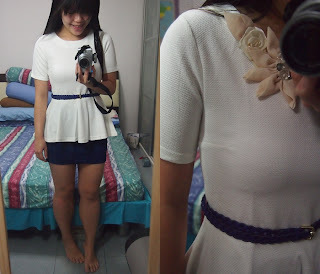 Maybe because this top is very cheap, justify for the no lining fact. LOL. anyway, pls skip this top if you are not a truly peplum fan. the peplum featured is kind of wavy. if the peplum you like is the subtle/flat kind, say no to this top.